I didn't see a thread for Marshalls, which is not surprising as Marshalls rarely stocks Lego. However, I have noticed a few sets here and there at certain locations (mainly Chima). A few months ago, I saw the Brickmaster Chima book at a store, though I didn't see how discounted it was. 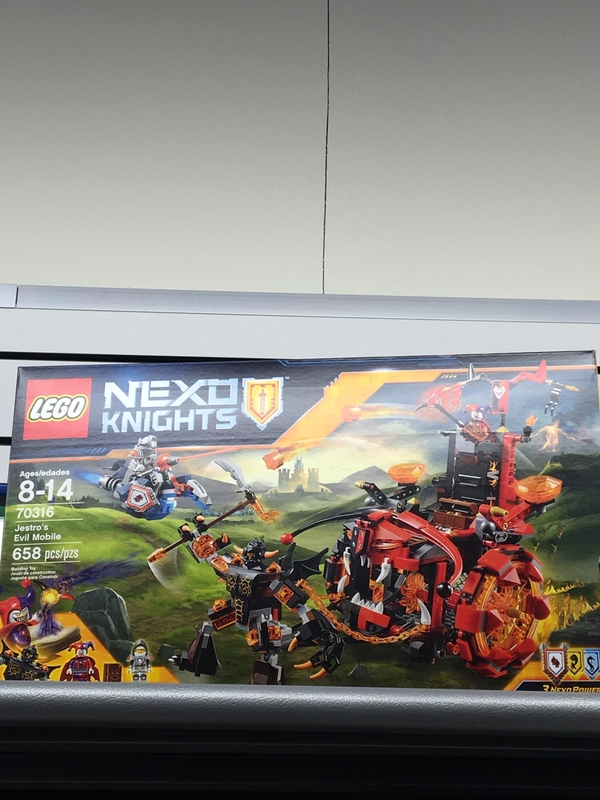 I also saw the a couple sets from the most recent Chima release. Bladvic's Rumble Bear was $29.99 ($10 off), and Mammoth's Frozen Stronghold was $44.99 ($15 off). Has anyone else seen Lego at Marshalls? No, but if there is lego there my mom will find it. I never find anything there, but my mom can go in and come out with and Armani suit for $20. I don't know how she does it. ^probably the same way I can go to Tesco and they have the new 2016 sets all at 75% off. At least, that's my story and I am sticking to it. Similar to Homegoods where I am. I've never seen a set, but have seen plenty of books. And they are usually dirt cheap, even compared to the multiple discounts the books typically see. ^Homegoods is the same company as Marshalls and TJ Maxx. I've never seen LEGO at Marshalls, but I have seen it at Maxx before. Typically discontinued sets. I picked up a lot of Prince of Persia sets there for a deep discount. But since then I have seen very little LEGO. Likely because LEGO doesn't need to have deep discounts anymore. Saw the same Mammoth stronghold at my local TJ Maxx. Wouldn't touch it with a 39 and a half foot pole until it's at least 75% off minimum. We have all 3 (Marshalls, TJ Maxx and Homegoods) near each other. With Lego stuff only found at Marshalls, like the giant storage bricks and random Friends stuff or long ago they had PoP. But not much else otherwise around these parts. And nothing found at TJ Maxx or Homegoods. 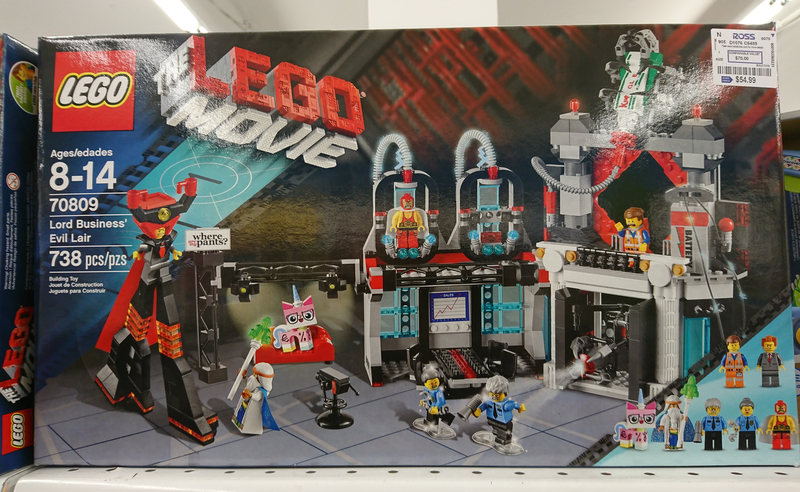 During Christmas season, saw TLM sets at one Marshall's as well as Bionicles at most stores I visited. Do these stores carry extra Lego stock over the Christmas season? I certainly didn't notice any. There's one of those near me...maybe it is worth a try. I went to Ridge Goodman yesterday and am going back today. Here's what I saw and what I think of resale potential. Some Mixels bags for $4. Got 3 #41552, might go back for the #41546 and 2 #41551. Lately I've been parting out sets rather than try to sell them whole. The toy section is smaller (one shelf now has pillows) and there was no more actual LEGO, just some Chima lunchboxes. ^^How the heck is a Chima Rumble Bear resell worthy?! Do you mean as parts? As a set no one is going to pay over retail for that thing, and it would be unlikely you would even get that. I ended up returning it because it wasn't selling and I needed the cash. I wasn't parting out back in February, but that's what I'd do with it now. MSRP discount often isn't correlated with profitability, so I check each particular set. Modern sealed sets can be hard to sell because of shipping costs and a crowded market. Anyway, I rarely check the store near me since it usually just has MegaBlocks and worse. However, I was in there for something else and found a bunch of clearance DUPLO. I checked prices and went back, got 5 #10605 @ $10.99 and 9 #10819 at $9.99. Also 4 #70330 for $5.99, maybe. Some #70743 for $6.99, nope. #70316 spotted at TJ Maxx which is owned by the same company as Marshalls. The price marked on it was $38. Saw Jestro's Evil Mobile for $38 at Marshalls last time I was in, passed. I haven't noticed any pattern to when they mark down stuff or mark it down further. Their regular price is white sticker, intermediate clearance red sticker, final clearance yellow sticker. Also saw 2 copies of Jestro's Evil Mobile for $37.99. I'm going to wait until the price drops more, like I saw happen with some Chima sets last year. Not a bad deal... still confuses me why Marshalls gets surplus Lego. #70316 finally marked down to $30. Gotta wait it out for a couple months, apparently. An OK deal for parting out but I already have enough to do with my BL store. Maybe I'll wait for a bigger discount. 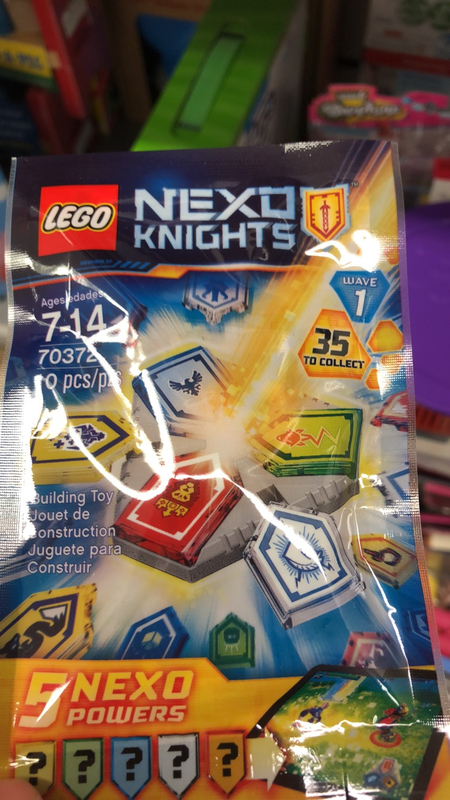 A couple trays of #70372 nexo shield pack wave 1 at $1 - what it took for me to bite on those. 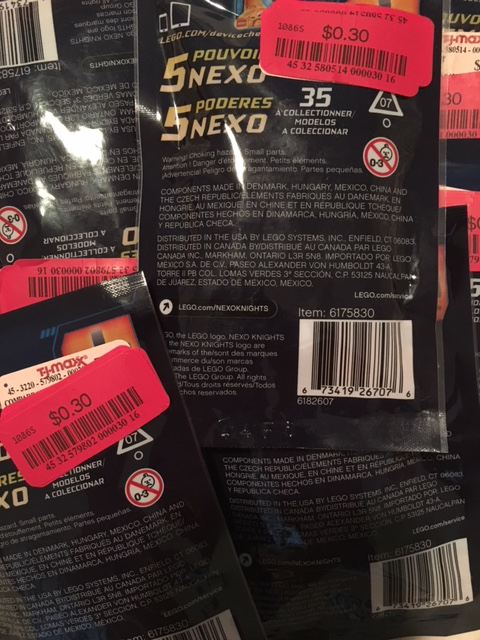 some were missing stickers or had $2.99 stickers but the cashier rang them up at $1, they usually don't do that. Got 84 bags; a large quantity of a small set is easy to handle. #71221 Wizard of Oz Dimensions Fun pack at $2, that can't be bad. Yes, but what are they good for? Maybe if they were 5 cents. Can confirm that these were also stocked in Northern CA. I loaded up on these (about 10) for $1 each as well two months ago at TJ Maxx. Really in my price range!! Thx! This time a 41618 was $7 and another was $9.50. Not the first time I've seen Marshalls with multiple copies priced differently. $9.50 is still an okay deal and goes with the $7 one so I can part out quantity 2. 41151 was down to $5, got the one left. 2 #41600 at $4, yes please. #41601 at $4 was a maybe I passed on for now. #41185 for $4 is a definite no. I got these today at Southtown T.J. Maxx. 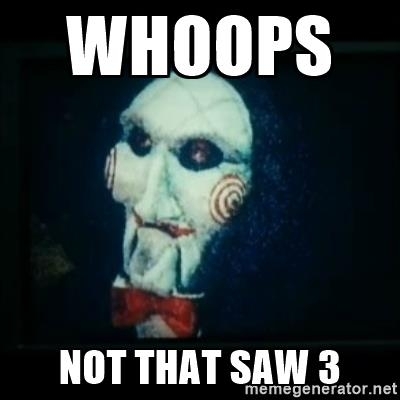 I meant #41485. Thanks for catching that. 41185 I was glad to get at WalMart for $25 in 2017 and might still take for $30 or so if I happened to see the old set kicking around. Anyway, found another 41618 for $9.50 and none of the $4 brickheadz had been marked down further. Is there a Ross thread? Found these tonight, but the price was meh. Boxes were nice though. Uh, I'd say that price is pretty good. That's a 5 year old set. Yeah, Bricklink for a used complete set starts around $51, and new sealed ones start at 70. Not an investment set probably, but def a pretty good price. 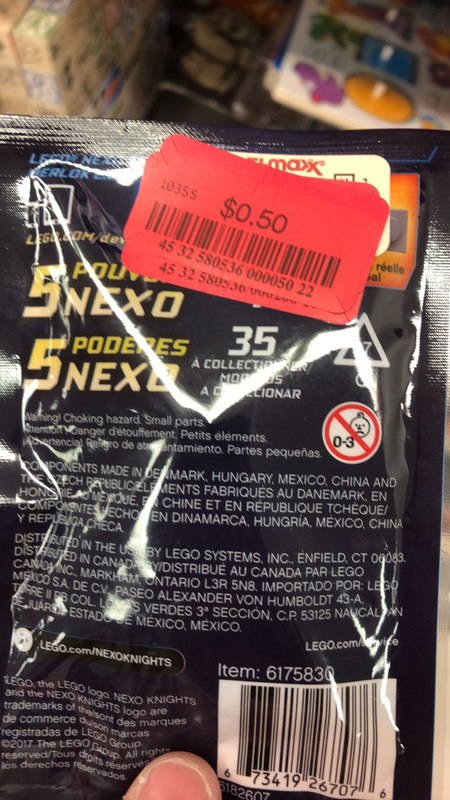 Yeah it's a five year old set at a discount store, not ebay or Bricklink, so I expected it to be lower. Either way, I'm not a seller and it's not a must have set for me so I left 'em.